Database-as-a-Service (DBaaS) has now become a buzzword in the IT industry. Organizations are starting to realize the benefits of database as a service thanks to the ubiquity of "The Cloud". Companies relying on Oracle databases for managing their data can also get on the DBaaS fast track thanks to Oracle Enterprise Manager Cloud Control 12c. Using EM12c you can enable self-service and rapid provisioning of Oracle databases and enjoy all the benefits (well most) of Cloud computing. EM12c supports both IaaS and PaaS models. These are also tightly integrated with Oracle VM Server along with their engineered systems including Oracle Exadata Database Machine. Thanks to the Rapid Start Kit we can setup a fully configured DBaaS environment in minutes. The exadata_cloud_setup.py script is the one that is executed to setup DBaaS. Don't worry, it doesn't require an Exadata machine. You can view the command line options for the scripts by running emcli in script mode. comma separated list of 'Target Name'(s) for 'Cluster Database' targets discovered in Enterprise Manager. Choose Container Databases for PDbaaS. comma separated list of 'Target Name'(s) for 'Host' targets discovered in Enterprise Manager. Cloud input XML defines Enterprise Manager entities created as part of Cloud Setup. Default file config/pdbaas_cloud_input.xml will be used for pluggable database setup. Pass custom input xml file to override default input file. emcli @exadata_cloud_setup.py : Sets up Cloud for PDBaaS if CDB is available in Enterprise Manager. Setups up DBaaS otherwise. You should edit the dbaas_cloud_input.xml configuration file to change the default role and credential names as well as default passwords. To setup a Pluggable database as a service (PDBaaS) environment, you need to have an existing Oracle 12c RAC or single-instance database using ASM for database storage. To find the the list of container databases we can use the emcli get_targets command as shown below. 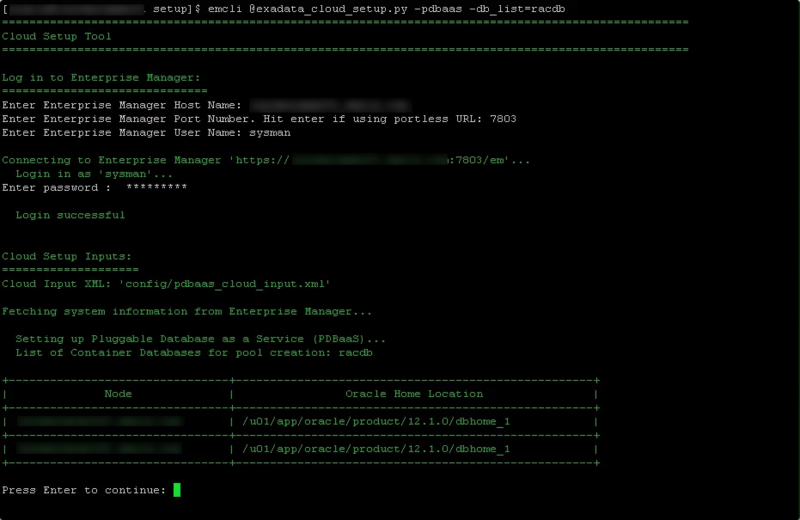 The screenshot below is an example of setting up a PDBaaS on a RAC 12c cluster. After completing the setup simply login as one of the SSA users. Part II will show how SSA users access the Self-Service Portal to request databases. Thanks for sharing this Leighton! Looking forward to your presenting @ Collaborate.